Snap into some pickled beans. I met Jason Kramer, “Brine Master” of Kramer’s Korner, at the Birthright BBQ Fest at Dallas Heritage Village last weekend. He was serving his pickles next to the folks at Cattleack Barbecue. I watched as guests asked for extra servings of Kramer’s Korner beans. I also watched a few people eat their beans before they even walked away, and then stick their red and white checkered food tray back out, with no shame, for more. Each jar of Kramer’s Korner is marked with the number “4.” This is because it took him four tries to perfect his recipe. He started with what he thought his grandmother’s recipe was and then just kept adjusting it until he got perfection in batch number four. All products contain no sugar, no preservatives and are made with all-natural, organic ingredients. As of now, they make pickled beans and cucumbers with the occasional limited edition asparagus and carrots. 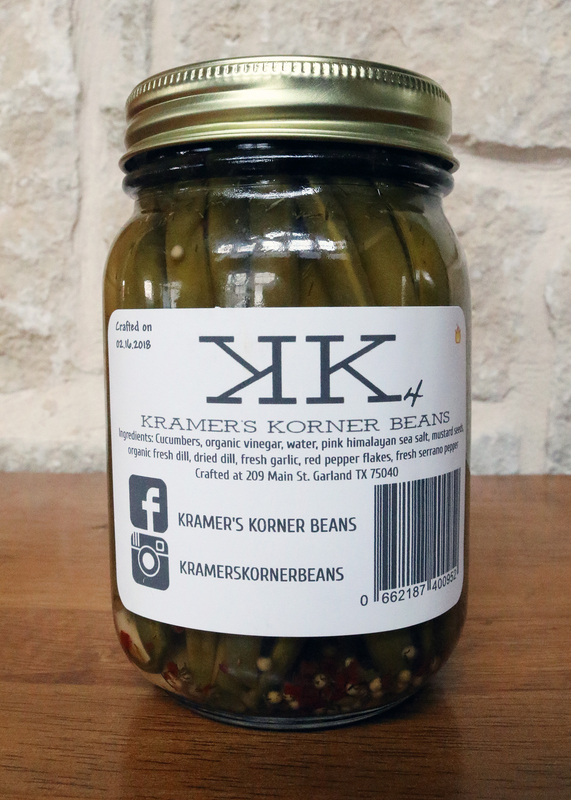 You can find Kramer’s Korner at local farmers markets and online.